Last week I went for a Bupa Fitness Assessment courtesy of Bupa Running. 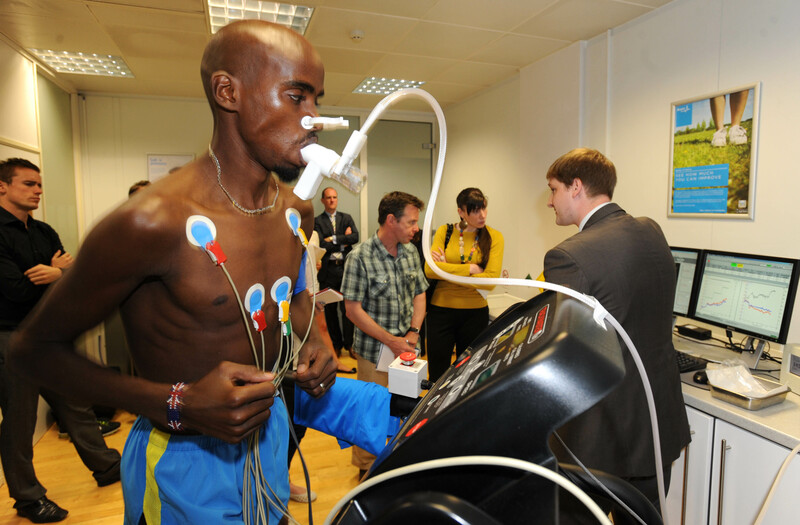 Mo Farah (a little more photogenic than me) undertaking the Fitness assessment. I was met at reception by a Health Advisor and taken to a treatment room (large doctors consulting room with a treadmill in the middle). We started with the pre fitness tests, measuring height (I’ve exaggerated mine by 2cm for years), weight (ah em.. but not too different from what I will acknowledge at home), waist (breath in!) and then from electrodes attached to my wrist and right toe (fortunately my least mangy and not black or missing toenail one) for body fat analysis. Then lung function test (a couple of attempts blowing hard into a mouth piece) and blood pressure. Next I was wired up with 10 electrode pads (I know how many because I was counting them when trying to find them all to remove!) for the ECG. Don’t worry Ladies you don’t have to strip to the waist and run that way like the gorgeous Mo for the test! A discreet undress under a towel, sensors and wires placed and re-dress. Like the blood pressure test I lay on the bed while they took heart and pulse readings at rest. The health advisor then went out to review my heart trace data with the doctor and I sat on the edge of the bed legs dangling like a nervous teenager for them to return! Fortunately they both returned so I assumed my ECG showed that everything was functioning as it should be! Onto the treadmill attached to many wires plus a blood pressure cuff and a mouth piece and nose clip. It took a while to get used to breathing from my mouth only and cope with being attached to many tubes and wires. The V02 test used is actually an estimated VO2 max extrapolated from analysis of exercise at an estimated 85% of maximum heart rate. My heart rate, blood pressure and gasses (what breathed out) were analysed while I walked/jogged on the treadmill for periods of 2 mins at increasing speed, starting out at 4km/hr up to max 8km/hour. As expected from Bupa, it was well done in a professional way with every care. The Doctor checked my resting ECG before the treadmill test and was present while it was carried out. The need for safety is no doubt the reason for using the sub VO2 test and not risking someone who might be unaccustomed to exercise, over exerting themselves at maximum heart rate. I was a little disappointed that the VO2 max test was not a full test. The test is based on estimates of max heart rate (220 minus age which is 175 for me) and testing to 85% of this took my heart rate to 148 only during the test. I didn’t have to work very hard during the test and know from wearing my heart rate monitor for BMF classes my heart rate is probably higher, regularly reaching 190 and sometimes over 200 and wondered if this would affect the result. I’d also really like to know what my max is! That said the estimated VO2 max score for me, according to various tables I looked up the internet show my level of fitness range from above average to excellent and my feedback in my report is that I have a ‘high level of fitness for my age’ so it probably is a useful test despite my worries! I do wish I could have done this when I started out 6 years ago as it would be nice to see the improvements I’ve made in black and white as stats! It was great to discover that my body fat % is lower than I thought so the past 6 years have been gradually doing some good and I can use the ‘athlete’ mode on my scales which give the same result! I am still working on losing a few pounds (less weight to carry round a race) and as expected, the results show me to be at the upper end of normal for weight and waist-height ratio so I need to continue to work on the belly fat despite having a good body fat %. What was also very useful to find out from all the gas analysis and body composition was a calculation of my basic metabolic rate calories which is higher than I currently work from. I received a full report with all the data and results (cardiovasular, and respiratory performance, metabolism, lifestyle (from pre-assessmsnt questionaire) etc.. with traffic light indications on action required. Yay all green! Got to keep it up! The report is personalised and includes references to our general conversation during the assessment, encouraging me to keep up my running and BMF classes for overall health and fitness, wishing me luck for my 10K goals and makes suggestions for interval training and training programmes for races. A useful and interesting assessment. It didn’t tell me anything, as a regular exerciser, that I didn’t expect (I should be fit with all that running) but it did highlight a few things. It would be good to have an assessment like this before and after a long period of exercise to get feedback on results and I think would be a very useful review for someone thinking about starting running or training for a race or concerned about their health and needing motivation to get exercising. Categories: fitness, Product review, running | Tags: 10K training, Bupa Fitness Assessment, Bupa Running, half-marathon training, Running | Permalink. It all sounds very interesting, o fit one. Great review – very helpful to anyone considering this. Yay – all green brilliant!! I think BUPA must have dodgy measuring tapes, I was also 2cm less than I thought. Wow, I’m glad other people have heart rates WAY above their “max” during intense workouts! Sometimes I don’t feel I’m pushing too hard, then see I’m pushing 180 bpm!